On Tuesday 7 February there will be another screening of Rebel of the Keys at JW3. Following the screening there will be a Q&A with musicologist Dr Anastasia Belina-Johnson and Mark Charles, pictured here while filming scenes for the documentary in Paris. We are now pleased to announce that the Q&A will be chaired by the composer and conductor Dimitri Scarlato. Dimitri began studying the piano at the age of 5, and aged 6, the violin. At 18, he enrolled at the Conservatorio di Musica S.Cecilia in Rome, as well as also gaining a BA in philosophy at Università La Sapienza. He then worked as pianist, musical director and composer at prestigious Italian theatres: amongst them, Teatro Regio in Parma and Teatro Argentina in Rome. After a masters degree in composition at Guildhall School of Music and Drama, he composed for many short films, including the 66th Venice Film Festival selection, The City in the Sky. He was in the music pre-production of Tim Burton’s Sweeney Todd, was selected as a film composer for the Berlinale Talent Campus 2011, and was the conducting coach of Sir Michael Caine in the critically acclaimed film, “Youth”, by Oscar winning director, Paulo Sorrentino. Dimitri then obtained a Doctorate in Composition at the Royal College of Music (he was selected as 2010’s RCM rising star). His music has been performed at various prestigious venues such as London’s Barbican and Cadogan Hall, and Rome’s Teatro Olimpico and Teatro Palladium. In 2011 he was selected to join the VOX 3 – Composing for Voice workshop at the Royal Opera House in London, and in 2015 he won the 3rd Composition Competition at the International Spring Orchestra Festival, with his piece Caduceo, for two pianos. Two of his operas, Fadwa and La tregua di Natale, have been fully produced and staged by Accademia Filarmonica Romana and Nuova Consonanza (two of the most important music institutions in Rome). In recent years he has focused on conducting Russian romantic symphonic works and operatic repertoire, as well as premiering new works of living composers. He has also worked on various projects as a songwriter, producer and arranger for singers and bands such as Appassionante, Amici Forever, Monica Iconica, Barbara Cavaleri, David Habbin, Sahara Collective, and Sacha Morgan. He lectures History of Music at the Royal College of Music and regularly collaborates, as teacher and Composer in Residence with MiSST, a trust funded also by sir Andrew Lloyd Webber. On Wednesday 16th November Rebel of the Keys will be screening at Pontio as part of an event coordinated in partnership with The Welsh National Opera and Bafta Cymru. In making the film it was a real journey of discovery uncovering the life of André Tchaikowsky, and we had the privilege of meeting and interviewing some of the world’s most renowned musicians. We weren’t the first people to go on that journey though, back in the 1980’s David Ferré went on a research journey of his own and he left us with a quite wonderful treasure trove of interviews he had made audio recordings of. David bequeathed those audio recordings to the André Tchaikowsky Archive at The University of Warsaw, and, as the photo above depicts, musicologist Anastasia Belina-Johnson was able to study all the transcripts and listen to the audio recordings as part of her research for the film and for the book A Musician Divided. The recordings include interviews with the librettist John O’Brien, Conductor David Zinman, Pianist Peter Frankl, and most crucially for us André’s agent and close friend Terry Harrison. Terry had passed away before we started making the film but thanks to David’s recordings we were able to use extracts of Terry’s voice in the film. David Ferré continues to research André Tchaikowsky to this day and posts all his findings on his website dedicated to Tchaikowsky. MARK: We tried to create a balance between talking heads, stock footage and re-enactments – not overdo reenactments, not overdo stock footage so we still engage with the people that care about him. I think that was important because he affected so many people and we wanted to show that. But yes, it’s frustrating not being able to see as much of him as, say, someone like Glenn Gould where there’s a treasure trove of footage. Early on into making the documentary we found out the amazing news that the opera was going to be performed, can you tell us the story of how this came about? ANASTASIA: When we were looking at the diaries there were some very poignant entries about the first play-through and André’s disappointment that it didn’t make it to the season at the ENO. Reading about David Pountney being one of the “culprits” as it were, and then having David look at the score again he sort of actually felt a moral responsibility to put the wrong the he did right. So it was unexpected for all of us – for David to say, “we are going to do this opera” is a better outcome than we could have hoped for. What difference did it make to you Mark as the director of the documentary? MARK: incorporating the opera story helped because it juxtaposed his narrative and created a present day narrative to help break up the scarcity of archive footage we had. It gave a little bit of his voice, I like to think it was him speaking in a sense. With the opera you just have to experience it, a bit like jazz. If you see it live it’s a beautiful production, simple, it’s elegant and it says a lot. The director, Keith Warner, was very perceptive and astute and understood how to give it life and it correlates with a lot of political things that are happening now and it feels quite present. The opera was a great success, but none of us actually knew if it was going to be any good. Can you tell us about the play-through? ANASTASIA: It was interesting to see the score for the first time but of course it was quite difficult to “hear” it and having the play-through was very interesting and useful. It was immediately obvious however looking at the libretto and how the dramatic action unfolded, that it was a very good work dramatically speaking and I remember the question I posed to David Pountney, “what would make you accept this opera into production?”, and he told me, “well it has to be a good work”, and it is more than that, it really is a masterpiece. Everybody who sees it agrees that for somebody to write their first opera with very little experience of orchestral writing and vocal writing at this scale, it’s just incredible. And going through the rehearsal process and then finally hearing it with an orchestra just opens up another world. And I want to add that the opera really is direct, it speaks to you very openly and directly. It’s not an opera that you really have to struggle to understand, it’s just there to be experienced. MARK: I think also because we’re at JW3 it would be relevant to talk about the Jewish aspect. For me, at that point I learnt about my Austrian Jewish heritage that I didn’t know of. I thought I was just Austrian, I didn’t know the other bit. So I was traveling in Warsaw and finding out about André’s story and you realise the weight of everything. You wonder how different André might have been? We will never know but it affected everything for him, the way he was with people, his relationships, his music. His music would probably not have been the same. He was broken in many ways, always trying to fix himself. I think sadly he was just starting to mend himself just before he died. You can see just how those things shape people and shape us, and that was, for me, quite profound. Anastasia, on that journey of discovery, was there anything in particular that felt profound for you? ANASTASIA: Learning about human history, learning about this one experience was significant and the poignancy of André’s life and actually the loneliness of his life, and it is very beautifully reflected in his opera. It is about many things but it is very much about loneliness and of being alone in life and society. Yes, that’s the lesson I learnt from this experience. Before the screening Maciej Gryzbowski played André Tchaikowsky’s Piano Sonata and The Inventions. Then, after a short Q&A on stage to introduce the film, the lights went down and we held our breath in anticipation of the audience reaction. It was only when the first laugh came – André was a colourful character – that we were able to relax and enjoy the moment. Thank you to everyone who afterwards shared their appreciation of the film with us and to the journalist, Lucie Pierron, who wrote the first review of the film with which she concluded it was “a voir”. This article was originally published on Bachtrak on 1 December 2015. The second part was dedicated to the documentary Rebel of the Keys directed by Mark Charles. The 60 minute version was screened, while the original is 90 minutes in length. The project that began four years ago was shown for the first time to the public in the legendary concert hall of the Warsaw Philharmonic. The director spoke of the challenges in making this film: there is very little archive footage of this composer/pianist and it was necessary to make some quite draconian decisions as to which anecdotes to include in the film. The result is nevertheless a great success and immerses us intimately into the life of the composer for an hour. The testimonies are well chosen and hit the mark. The film shows us a composer and pianist with a complex character. A capricious man, he is described by one of his friends as a “wonderful and awful person”, but nevertheless a true musical genius who had “more in him than he gave us, but who wasn’t that interested in doing it”. A genius nevertheless. The strength of this documentary is that it presents an authentic a portrait as possible. The narrator does not resort to melodrama when she describes André’s painful childhood where escaped from The Warsaw Ghetto in 1942 with his grandmother. His mother perished at Treblinka in the same year. The accounts from people close to him explore the different aspects of this man who was tortured all his life by the humiliation he lived through during his childhood. And so we are presented with a portrait of a man who is a genius pianist and composer, a homosexual, a manipulative and impulsive man who is capable of picking up on and then exploiting a person’s weaknesses. He is nevertheless a great artist who continued to compose his only opera right up to his death, refusing morphine injections in order to remain lucid enough to be able to finish his work. André’s dying wish was to give his body to science and his skull to The Royal Shakespeare Company. The documentary finishes with the narrator and musicologist discovering André’s skull nearly 10 years after beginning research on this curious character. A very emotional moment for the audience who applauded the work of these André Tchaikowsky enthusiasts. A film worth watching. On the eve of the first performance of the opera “The Merchant of Venice” in Warsaw, we thought we would share an extract from Journey To Bregenz where the conductor Erik Nielsen talks to Anastasia Belina-Johnson about Andre Tchaikowsky’s first and only opera composition. 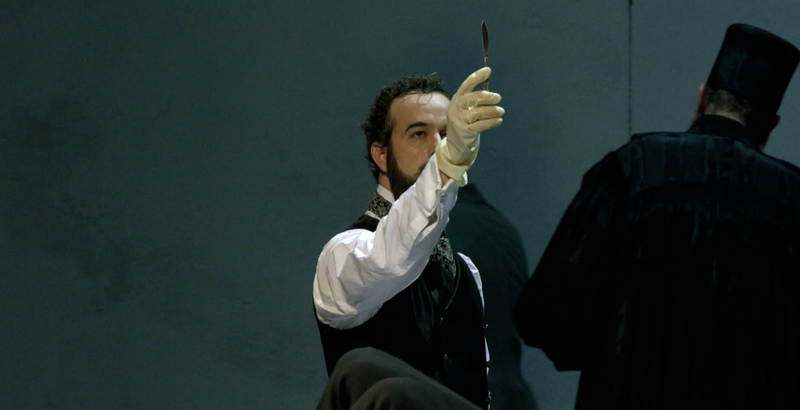 Erik conducted the first ever performance of The Merchant of Venice in 2013 at the Bregenz Festival. Tonight’s performance in Warsaw will be conducted by Lionel Friend. Last summer (2013), in the stunning setting of The Bregenz Opera festival in Austria, Andre Tchaikowsky became current again. Some thirty years after his death, his opera composition of The Merchant Of Venice was performed for the very first time. Our documentary team followed David Pountney, Keith Warner, Ashley Martin-Davis and the cast and crew of the opera as they bought Tchaikowsky’s Merchant Of Venice to the stage for the very first time. Taking on an opera that had never been performed before was a brave and challenging experience for all involved, but it was a risk worth taking. The opera was critically acclaimed, and many of the people we interviewed for our documentary, Rebel of the Keys, were amazed by how accomplished it was given that it was Tchaikowsky’s first opera – it begs the question of what could have been if he had not died so young. This October The Merchant Of Venice will be staged again, this time at the opera house in Warsaw, in Andre Tchaikowsky’s own country of birth. If you are able to be in Warsaw around that time, it is something special and something new that is worth experiencing.